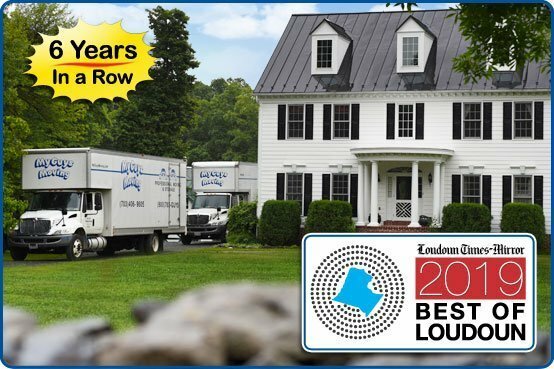 For six years running, My Guys Moving & Storage made the Times-Mirror’s “Best of Loudoun” as one of the Best Moving Companies in Loudoun County, VA. We also made the category of Best Storage Company in Loudoun 2019. For several years now, we’ve been trading first place with our competitor, JK Moving, who took the top spot after last year’s tie. Hats off (big respect) to the largest independent moving company in the United States. According to the community newspaper, a record 56,000 participants cast more than 245,000 votes in 233 categories ranging from agritourism to women’s clothing stores. See all the winners in the Loudoun Times-Mirror’s special section by visiting Best of Loudoun. All of us at My Guys Moving & Storage appreciate our customers’ votes of confidence to make My Guys one of the best moving companies in Loudoun County for the 6th year in a row! To show our appreciation, we will continue to give back to the communities that we serve. Thank you, Loudoun, you’re the greatest!